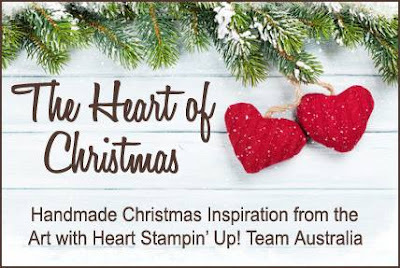 Hi everyone and welcome to week 15 of Christmas inspiration with Art with Heart Stampin'Up Team Australia. For todays card I used Garden Green card stock and used Gold Foil paper for the 1st mat. I made a mini little loaded pocket envelope, I made the smallest envelope on the Envelope Punch Board and trimmed it right down to what looked like the right size for the card, I added a scalloped glitter red circle, cut a Doily in 1/4's, cut out a plum pudding from Christmas Around the World DSP and I also used that for the front mat of the card, I punched out the gingerbread man and just stacked them all up in the envelope, added a piece of Quilted Christmas Ribbon around the envelope and topped it with a snowflake cut out from the Seasonal Layers Thinlets, I used the wavy scallop from that set to cut out the Red Glimmer wavy paper on the side of the card. The gold embellishment pieces on the wavy red scallop are from the Santa's Sleigh Thinlet set using Gold Glimmer paper. For the tag I used the Everyday Label Punch and cut out a piece of green DSP and used Cherry Cobbler Ink pad for the sentiment from Merry Little Labels stamp set and used some Mini Gold Sequin Trim and tied a bow around that with the 1/8 Gold Ribbon and finished of with some Gold Enamel Metallic shapes. And a peek inside the card..
Hope you enjoyed this weeks card. 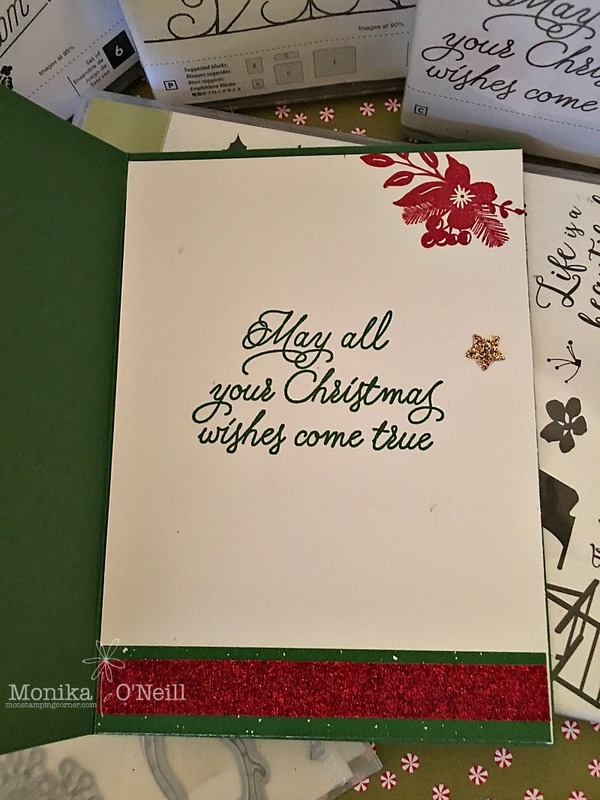 To see more beautiful inspiration from our very talented ladies you can view all our participants on the lovely Tina Gillespie blog. Have a great week and will see you again next week with some more great cards.